This was yet another quick and easy recipe that I threw together in a flash and was pleasantly surprised at how absolutely full-bodied and flavorful it turned out. I accompanied this lovely soup with some of my Veggie Pulp Crackers that I had dehydrated from the Creamy Veggie Sauce on Zucchini Pasta. F A B U L O U S!!!! I will definitely make this again. When people claim raw food prep takes too long, they really have no idea. There are so many wonderful quick and easy recipes that can be thrown together in a matter of minutes. The cumin and lime blended so well with the carrot. 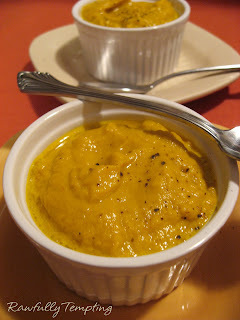 One of my favorite quick blender soups so far! (Select "Quick" in the CATEGORY drop down menu and see for yourself). 1. In blender, mix carrots, water, garlic and ginger. 2. Add red onion, avocado, lime, cumin and salt, and blend until creamy. 3. Add more water as needed for texture. 4. Serve and garnish with cracked black pepper. Serve with Veggie pulp crackers or raw spicy kale chips. Carrot and avo are perfect for a quick soup, and those spices sound great. I just love carrots so much that I seldom blend them, but I often eat them three meals a day, so carrot soup should make it in there at some point! Trying to figure out how many servings this makes. Based on the ingredients, I'm thinking two small servings or one large? Trying to plan my shopping list to prep this for 8 people. Melissa - this was 2 servings for us...smaller for sure. I find people don't eat large bowls of raw soup..so for us these were normal portions....i hope your dinner guests enjoy it! Thanks! I am part of a raw food swap, and this will be my dish of the week (plus dinner one night for my husband and I). Looking forward to trying it!